The Pantheon is open from 8:30 a.m. to 7:30 p.m. Monday to Saturday; from 9 a.m. to 6 p.m. on Sunday; and 9 a.m. to 1 p.m. on holidays that fall on weekdays except for Christmas Day, New Year's Day and May 1, when it is closed. You’ll meet our professional English-speaking guide in the prearranged meeting-point, which can be changed according to guests requirements. We’ll start this marvellous tour of Rome by visiting the most sumptuous fountain in Rome, the Trevi Fountain. The massive Trevi Fountain, fronting its own little piazza, became one of the sights of Rome following the opening of the film Three Coins in the Fountain. The Fountain was begun by Bernini and Pietro da Cortona, but there was a 100-year lapse in the works and the Fountain wasn’t completed until 1751 by Nicola Salvi. The central figure is Neptune, who guides a chariot pulled by plunging sea horses. Tritons (mythological sea-dwellers) guide the horses, and the surrounding scene is one of wild nature and bare stone. Our next stop will be Rome’s best-preserved monument of antiquity, the imposing Pantheon, which was built by Marcus Agrippa in 27 B.C. (though later rebuilt by Hadrian) as a temple for all the gods (from the ancient Greek “pan-theon”, meaning “all gods”). The marvellous ancient yellow marble columns testify the original magnificence of the temple. The statue of the Madonna is the work of his assistant, Lorenzetto. Nearby is the tomb of Maria Bibbiena, Raphael’s fiancé, who died three month before he. Above is the tombstone by Annibale Caracci. In the third crape is the cenotaph of Cardinal Consalvi, an exquisite work by Thorwaldsen. In the same chapel, the tomb of Victor Emanuele II of Savoy, the first king of Italy. On the altar of the seventh chapel is a 15th century fresco of the Annunciation by Melozzo da Forlì. 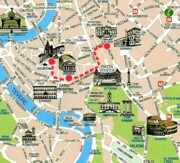 Finally we will reach Piazza Navona, one of Rome’s most beautiful squares and also one of its most popular hangouts. Piazza Navona was built on the ruins of the Stadium of Diocletian, where chariot races were held. In medieval times, the popes flooded the square for mock naval battles. Besides the twin-towered façade of the 17th century Santa Agnes, the piazza boasts several baroque masterpieces, the greatest being Bernini’s Fountain of the Four Rivers, with massive figures representing the Nile, Danube, della Plata, and Ganges – the figure with the shrouded head is the Nile, because its source was unknown at the time. The obelisk is Roman, from Domitian’s time. 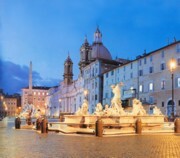 At the southern part of the square is the Fountain of the Moor, also by Bernini; the Fountain of Neptune, which balances that of the Moor, is a 19th century addition. Peel, stone and dice the melons. Then cook it in a pan together with spices and herbs until done.